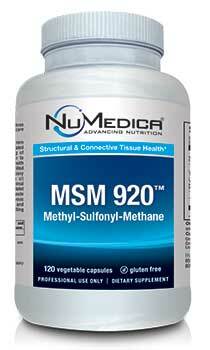 NuMedica MSM 920 is designed to provide your body with sulfur for excellent cartilage support. Sulfur is one of the most abundant minerals in the body. It is needed by your muscles, skin, bones, and cartilage. Many people don't get enough sulfur in their diet to support their bodies' needs. Sulfur comes nearly exclusively from the dietary proteins we consume. If you aren't getting an optimum level of sulfur from your diet, your body might be starving for it. For this reason, many people rely on helpful supplements like NuMedica MSM 920 to obtain the sulfur they need to support optimum health. While a significant portion of the sulfur in your body is needed by your muscles and skin, it is also required by various processes in your body. The keratin in your body, an important protein needed for hair, nails, and cartilage, is comprised in large part of sulfur. Because sulfur promotes elasticity of skin and cartilage, it is important for our flexibility and can even help us look and feel younger. If you want to ward off wrinkling skin as well as stiff and sore muscles and joints, you should consider taking a sulfur supplement like NuMedica MSM 920. Keep in mind that your body also uses sulfur to help convert carbohydrates into energy, to support detoxification, to enhance insulin function, and to support cellular elements like mitochondria-the energy centers of our cells. If you have reduced your consumption of meat, for instance, you might not be getting the sulfur you need to support your body's needs for this essential mineral. 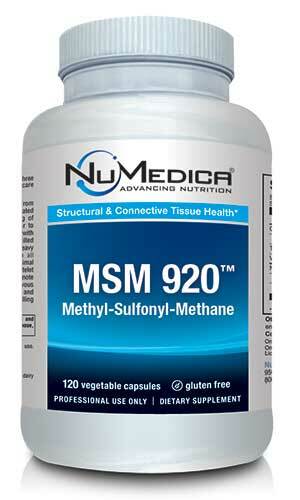 NuMedica MSM 920 can ensure you have the sulfur your body relies on for a wide range of health processes. NuMedica is a trusted leader of the natural supplement industry. By investing heavily in research and product development, NuMedica is able to create nutritional supplements that support a wide array of health needs. If you have questions about whether or not you should take a nutritional supplement along with your medications, be sure to consult your physician.